Rangitikei MP Ian McKelvie farewells the little blue penguin at Himatangi Beach. With him is Wildbase veterinarian Dr Kerri Morgan and Manawatu Standard newspaper photographer Warwick Smith. 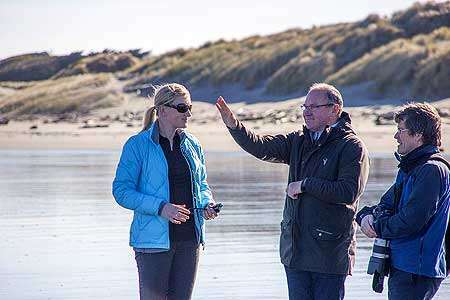 Wildbase Recovery Community Trust ambassador and Rangitikei MP Ian McKelvie joined Massey University veterinary staff to release a little blue penguin back into the sea at Himatangi Beach this morning. The penguin spent the past two months recovering at the university's Wildbase Hospital after being found starved and emaciated on a beach at Whanganui and receiving initial first aid from wildlife rehabilitator Dawne Morton of Wanganui Bird Rescue. Today it was driven out to the coast and carried about 800m down the beach, where Mr McKelvie and wildlife technician Deneka De Sousa freed it. The little blue penguin flopped over a few times as its legs appeared to buckle, briefly turned in the wrong direction away from the water and had to be picked up and turned around before it got its bearings. In less than a minute, it waded in and started swimming, bobbing through the waves to spend its first day at sea in eight weeks. Mr McKelvie, a Massey graduate and popular Mayor of the Manawatu District for nearly a decade until 2011, when he entered Parliament, was clearly moved. "The little blue penguin's release was the most exciting thing I've done since my time in the public eye," he said. The bird's recovery involved involved regaining weight, waterproofing itself and practising swimming. In future, much of that recovery period will occur in the public eye. Fundraising has started to build a unique facility in Palmerston North's Victoria Esplanade that will allow people to see rare native wildlife before they are returned to forests, beaches and wetlands. The charitable trust has been set up solely to raise funds to build and operate a wildlife recovery centre thate will be owned by the Palmerston North City Council and co-managed by Massey University's veterinary school. It is expected to attract 100,000 visitors a year including school trips and tourists. The little blue penguin released today weighed a healthy 900g after being just 543g when found. Wildbase veterinarian Dr Kerri Morgan says whenever possible wildlife are returned to the same location they were found. "But there are no known local little blue penguin colonies at Whanganui, so we suspect she may have been a bit off course. We've erred on the side of caution and decided to release her at Himatangi, where there is an existing population." Little blue penguins are the world's smallest, standing at 25cm. While found throughout New Zealand, they come ashore only at night to live in underground burrows, which means they are rarely seen. Their population has been declining, and their status is "near threatened". The biggest threat to their survival is predators such as unleashed dogs.